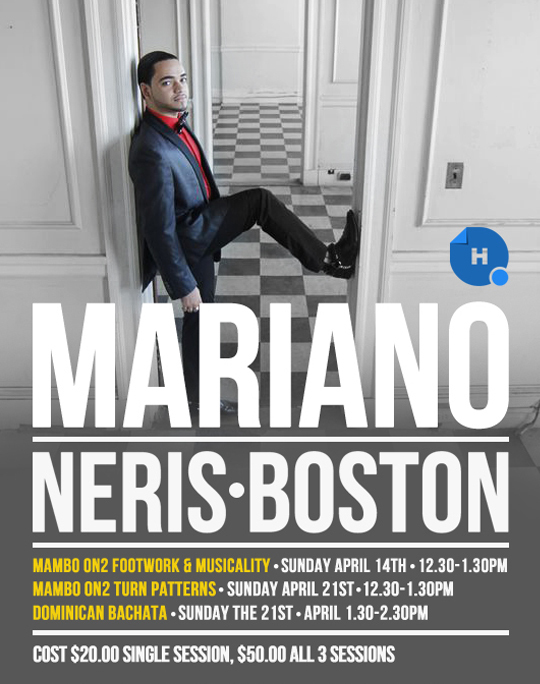 Mariano Neris II is a Latin dance instructor, choreographer, director, performer, trumpet player, band manager and graduate from the Berklee College of Music. Neris is Boston’s fastest rising Mambo headliner. Mariano has been recognized worldwide for his unique mambo style. He has headlined congresses and festivals all over Australia, the United States, the Caribbean, Italy, and Canada with his complex mambo footwork and flavorful partner work. His most recent dance accomplishments include winning 1st place on the World Latin Cup Qualifier at the Chicago Latin Street Congress 2011, and being selected to be one of the principal choreographers and dancer for Elvis Crespo and NG2’s new music video “Tenia Que Acabar,” filmed in Old San Juan, Puerto Rico. Neris spends a considerable portion of the year on tour; marking his presence at Latin festivals, teaching lessons, showcasing, choreographing routines for groups and couples, and training dancers all over the world, sharing his passion for the salsa/mambo industry. In his 12 years in the salsa business, Neris has become one of the many special attractions Latin festivals worldwide requests to have at their event.